This is part five of a series of articles that take a closer look on the relationship between increasing human population levels and the food production system that sustains human livelihoods. Part five and six examines the current state of the agriculture sector around the world. This post will focus on conventional forms of agriculture, it upsides and downsides, while part six looks on the possibilities of organic farming to feed a growing population. We cannot ignore the basic fact that population growth, along with rising incomes and urbanization, is the main socio-economic factor for increasing global food demand. Even if the total demand for food is estimated to grow more slowly this century, substantial increases in the global food production is required. To be able to satisfy the projected food demand during this half of the century we need to increase global food production by 70 percent by 2050. Preferably we need to do this without further degrading our already fragile ecosystems and natural resources. Our planet has considerable land reserves which in theory could be converted to arable land to satisfy future demands from a growing population. But the extent to which this is possible, or even preferred, is limited. Most of these land reserves are situated in only a few countries in Latin America and sub-Saharan Africa where the lack of proper infrastructure could, at least in the short-term, limit their contribution to the global food production system. But more importantly, large parts of these land reserves have important ecological functions that will be destroyed if turned into arable land. Considering these limitations, FAO projects that the global area of arable land will be expanded by five percent, or around 70 million hectares, by 2050. The environmental food crisis is a term that comes from UNEP and a report which the organization commissioned in 2009 in response to the food price crisis. The report concluded that food prices will increase and become more volatile from escalating environmental degradation. Conventional agriculture has had both positive and negative effects for human society. Technological innovations since the 19th century have managed to completely transform rural landscapes, populations and agriculture productions in the developed world. The key element of this transformation was the change from "on-farm" to "off-farm" resources. Thanks to new technological advances it became more economically profitable to replace human labour with machinery. Equally profitable became it to enhance the farm's soil fertility by just buying chemical fertilizers. The use of pesticide allowed farmers to protect their crops from pests while making large-scale agricultural systems more easily managed. These technological advancements have increased the productivity of the agriculture sector which in turn has led to food becoming more abundant and cheaper for consumers. The labour force which was replaced by machinery could also be employed in other production areas, and thus the total wealth of society increased. But this development has had socio-economic and environmental effects. The population decline in rural areas has led to major structural changes in which formerly agricultural regions now have unemployment levels above average and difficult social conditions. 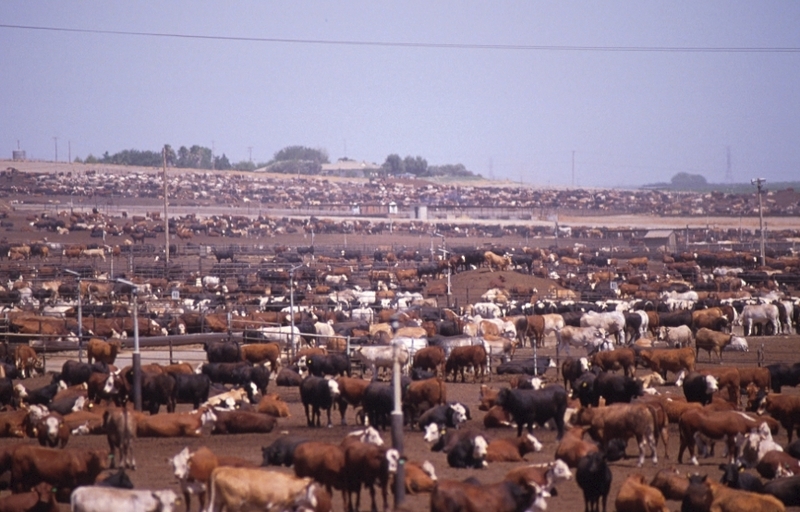 The technological transformations, in which agricultural systems have been detached from their natural roots, are especially evident in factory farms where livestock are involved. Just consider the housing of hens in battery cages and how little, if anything, it resembles the natural environment. As conventional farms are looking more like factories with industrial-like production systems, concerns for animal welfare and environmental health is becoming more and more significant in developed and affluent societies. There is no denying that the negative effects of conventional agriculture are far reaching. Reports show that 15 out of 25 ecosystem services, such as water supply or various forms of food production like seafood, are already degraded or used beyond sustainable levels. Actions taken to further intensify the use of the natural resource base and these other ecosystem services will often cause the degradation of other areas and services. The intensification of our food production system has caused loss of tropical forest and biodiversity, soil nutrient depletion, erosion, desertification, and depletion of freshwater reserves. Considering that irrigated agriculture is an extremely productive food system, it covers only one fifth of arable land but contributes nearly 50 percent of global crop production, it's worrying that fresh water reserves are being depleted at an alarming rate. All in all, conventional agriculture is said to be responsible for 75 percent erosion in biodiversity, land degradation and water destruction. Long-term projections do suggest that the world's natural resource base should be adequate to meet future demands, but only if the degradation of our ecosystem services are stopped, or at least significantly slowed down. The conventional food system is also responsible for massive greenhouse gas emissions. In the US alone, the conventional food system is with its 19 percent just behind cars when it comes to total usage of fossil fuels. Globally, our food production system is responsible for around 37 percent of total greenhouse gas emissions in our atmosphere. In the 1940s our food production system produced 2.3 calories of food energy for every calorie of energy we invested. Today it takes 10 calories of energy to produce a single calorie of food. This transformation is not hard to imagine considering how much fossil fuels are required in every process of the industrial food production system. Conventional agriculture requires chemical fertilizers and pesticides which are made with the help from natural gas and petroleum, it also requires heavy farm machinery and the whole procedure involves energy intense food processing and packaging, as well as fossil fuel-powered transportation systems to reach consumers worldwide. Despite its name, the Green Revolution should not be mistaken for an alternative or organic agriculture practice. It's quite the opposite. The Green Revolution can be seen as a neo-agricultural version of conventional farming practices of the 1960-1970s where the main aim is large-scale environmental modification. The Green Revolution involves the development, practice and distribution of high-yielding varieties of cereal grains, chemical fertilizers, pesticides, genetically modified grains, and large-scale irrigation infrastructure "“ all being practices that requires a heavy and constant input of fossil fuels. Norman Borlaug, whom was considered to be the father of the Green Revolution, continuously advocated for the use of pesticides and chemical fertilizers as a solution to growing populations and environmental degradation. Borlaug rejected claims that organic agriculture would be better for the environment as "ridiculous". Because organic farming resulted in lower yields Borlaug predicted that more land and forests would be required to be cultivated if we wanted to be able to maintain the same yield levels for organic farming as the ones achieved from more conventional methods. If we intensify our farming practices we can leave more land for the rainforest, Borlaug's thinking went. There's truth to this. Thanks to the "seed and fertilizer" practices of the Green Revolution, global cereal production tripled between 1950-2000 while land use only increased by 10 percent during the same period. UNEP's assessment for the future development of our food production system states that any future system will be dependent on and "must contribute positively" towards the realization of "healthy ecosystems and resilient communities". Clearly, the Green Revolution and conventional agriculture has no place in such a food system.